This is the tribal gathering place built by the local Native Americans in the Espanola, New Mexico, area. See? There’s kind of an amphitheater effect. It’s great! I was sitting here in New Mexico at a tribal gatherings place. And it’s circular. And it has a wonderful feeling to it. The sun is getting lower on the horizon. And I was sitting and meditating on my heart. And I had the most incredible experience. I just had a feeling we were accepting the energy of the Divine Feminine. And I just had a feeling I was sitting here with the braves and the ancestors of the Native Americans. I know it’s a strange thing, because I can remember several Native American lifetimes. But in this lifetime I’m not Native American. It’s just that I have that ancestral affiliation. So, I was sitting here, meditating on the Divine Feminine, in my heart. And I had the strangest feeling that I was … I think it’s called the Corn Maiden, in the Native American culture … the Divine Feminine expressed as the nurturing Giver of Life … Bringer of the Crops of Corn that fed the people. It was really great. So I thought I’d share. And I’m wishing you a wonderful, heartfelt day, in these times … this upcoming week when so much good energy is coming into our hearts, and into our fields, into our lives, and into Earth. … and over this way, coming over the mountains, is the plume of a forest fire … See? So, the mountains are renewing themselves again. Image: Corn Maiden, Marti White Deer Song, http://www.medicinebird.net/whitedeer/paintings/corn_maiden.jpg .. Image: Zuni Corn Maiden Kachinas by Alan Lewis, http://www.hopikachina.com/images/april2005/CornMaiden.jpg .. 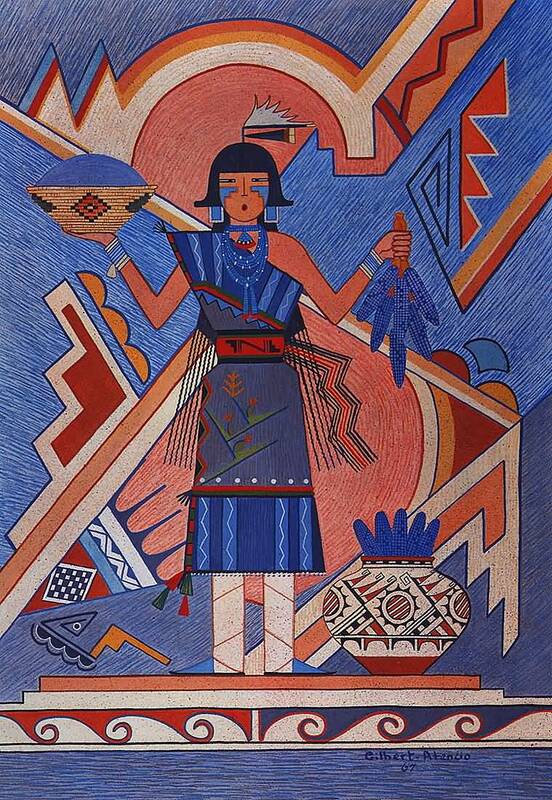 Image: “Blue Corn Maiden” by Gilbert Atencio, http://www.firstpeople.us/native-art/kasina/Gilbert-Atencio-Blue-Corn-Maiden.jpg .. 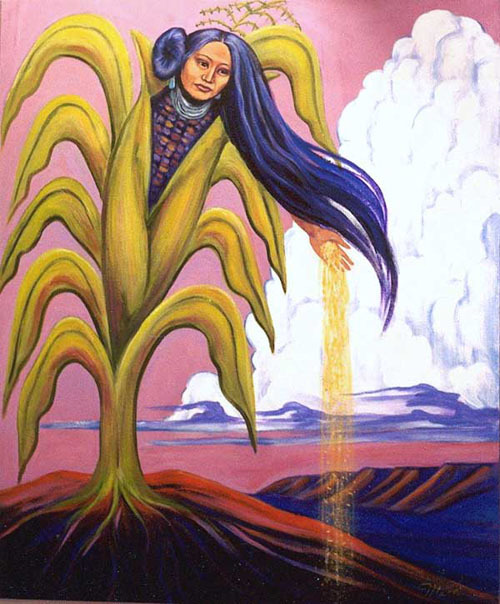 Image: “Navajo Corn Maiden” by Fr. John Giuliani, http://www.bridgebuilding.com/images/gcorx.jpg .. Image: Corn maidens, by Navajo Nora Yazzie, http://www.dreaminglodge.com/uploads/5/2/3/6/52369273/unnamed-3_2_orig.jpg .. Image: “Corn Maiden” by Terri Lambert, http://terrilambert.com/images/galleries/paintings/corn-maiden.jpg .. This entry was posted in Divine Feminine - Divine Mother - Mary Magdalene, Incoming light - grace - leveling up, Karma - incarnations - causal reality, Native Americans, Sexuality, Stories - myths - visions - legends and tagged corn maiden, divine feminine, incarnations, inco, incoming light, Native Americans, reincarnation, sacred sexualiy, visions on 28 December 2017 by Alice B. Clagett.